A tidal wave has hit in the in the national conversation of homosexual marriage and its true impact would not have been shown without social media. The past two days have shown the issue's "day in court" with a hearing on California's Proposition 8 and the Federal Defense of Marriage Act (or DOMA). The discussion has run the gambit from the absurd to the illogical to the passionate to the spot on points. Sotomayor poked at the concept that Homosexuals were being unfairly treated in the domain of marriage as a class and Kagan has a nice "gotcha" moment. Most of the court seemed to question whether Prop 8 had standing to be in the Supreme Court at all and on the legality of DOMA. In satire, the Onion published an article that those in support of equality wished was true and of course Jon Stewart presented the situation beautifully as always. I have covered this issue of marriage equality a few times in the past because, as a progressive human being, a system of classes where one class is denied rights by other classes is disgusting to me. Now feels like a special time in that conversation. The greatest thing for me, as a social media guy and a political guy and a political organizer, has been the Equality Symbol Meme. You have seen it. 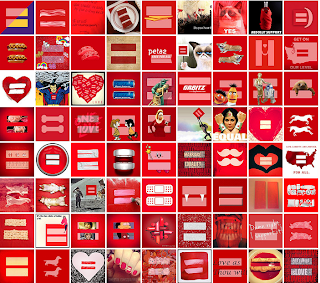 It is the red equals sign people have been using as profile pictures, you may have found it disorienting. This brilliant campaign was started by the Human Rights Campaign, an organization attempting to promote equality for gays and lesbians. What first started as a few Facebook friends changing their profile pictures to the standard red equals sign quickly morphed and flowed into a beautiful mosaic of hundreds of different versions of the symbol. 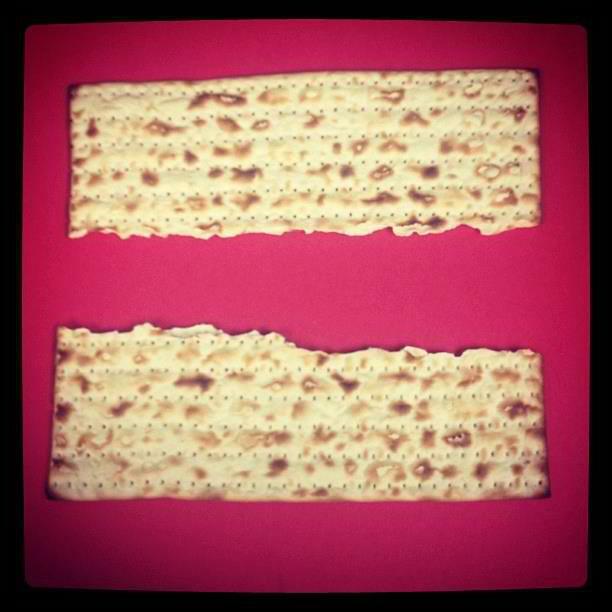 My cousin's friend actually made this one which I like to call "Unleavened Equality." This campaign that has swept the internet, gone viral and has caught the attention of various news agencies and has been adopted by almost everyone you can think of. The brilliant stroke here is that it is a great way to show support with an amazingly low threshold of adoption (how easy it is for the average person to get involved). It is insanely easy to set your profile picture to a red equals sign, for a short period of time to say to your friends, "this is important to me." This symbol of equality has been adopted by tons of celebrities and entertainment entities, organizations such as the Sierra Club and the attention of Time Magazine. Ignoring the arguments that yes, not everyone is on social media (though about HALF of the US population is) and true, Facebook may or may not make an effect on the judgement of the courts, it is still reassuring to see your network show solidarity. It comes to a point in the arguments made to the court. We are at a point in time where the national discourse on the issue shows, according to various studies, that more than half of the country, wants equality for all. This time also showed how horrifically scary one justice's beliefs were in general. Someone explain to me how you can talk about finding something "Fearful" and loathsome and consider yourself "unbiased?" Will this campaign affect the decision? Probably not. While Judicial proceedings do chat about the public discourse on what they are hearing, I doubt that they are paying attention to Facebook memes. It does make you feel like you are in good company when the majority of your "friends" and the pages you follow show support and solidarity to a class of people not receiving the same rights as others. One last note, is it just me or is Edie Windsor, the plaintiff in the DOMA case the most adorable lady ever?